This formula can replace a glass cleaner, an all-purpose cleaner, and a disinfecting cleaner and help to save you both time and money. The patented, dual-solvent formula is designed to dissolve greasy soils and provide an easy wipe-up, then simply evaporate to leave your surface streak-free and disinfected. For those environments where disinfecting is of the utmost important, the effective formula is a hospital-grade disinfectant. 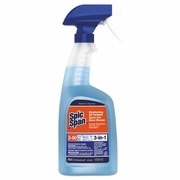 This versatile cleaner can be used on most surfaces including glass.Trigger Sprayer. 32oz. bottle 8/case.